(1) Scope. This rule governs a forfeiture action in rem arising from a federal statute. 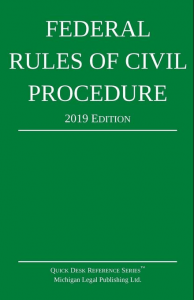 To the extent that this rule does not address an issue, Supplemental Rules C and E and the Federal Rules of Civil Procedure also apply. (f) state sufficiently detailed facts to support a reasonable belief that the government will be able to meet its burden of proof at trial. (3) Judicial Authorization and Process. (a) Real Property. If the defendant is real property, the government must proceed under 18 U.S.C. §985. (iii) a warrant is not necessary if the property is subject to a judicial restraining order. (C) someone specially appointed by the court for that purpose. (B) the court orders a different time when the complaint is under seal, the action is stayed before the warrant and supplemental process are executed, or the court finds other good cause. (iii) The warrant and any supplemental process may be executed within the district or, when authorized by statute, outside the district. (iv) If executing a warrant on property outside the United States is required, the warrant may be transmitted to an appropriate authority for serving process where the property is located. (B) the court finds that the cost of publication exceeds the property’s value and that other means of notice would satisfy due process. (C) name the government attorney to be served with the claim and answer. (B) only once if, before the action was filed, notice of nonjudicial forfeiture of the same property was published on an official internet government forfeiture site for at least 30 consecutive days, or in a newspaper of general circulation for three consecutive weeks in a district where publication is authorized under Rule G(4)(a)(iv). (C) instead of (A) or (B), posting a notice on an official internet government forfeiture site for at least 30 consecutive days. (b) Notice to Known Potential Claimants. (i) Direct Notice Required. The government must send notice of the action and a copy of the complaint to any person who reasonably appears to be a potential claimant on the facts known to the government before the end of the time for filing a claim under Rule G(5)(a)(ii)(B). (D) the name of the government attorney to be served with the claim and answer. (A) The notice must be sent by means reasonably calculated to reach the potential claimant. (B) Notice may be sent to the potential claimant or to the attorney representing the potential claimant with respect to the seizure of the property or in a related investigation, administrative forfeiture proceeding, or criminal case. (C) Notice sent to a potential claimant who is incarcerated must be sent to the place of incarceration. (D) Notice to a person arrested in connection with an offense giving rise to the forfeiture who is not incarcerated when notice is sent may be sent to the address that person last gave to the agency that arrested or released the person. (E) Notice to a person from whom the property was seized who is not incarcerated when notice is sent may be sent to the last address that person gave to the agency that seized the property. (iv) When Notice Is Sent. Notice by the following means is sent on the date when it is placed in the mail, delivered to a commercial carrier, or sent by electronic mail. (v) Actual Notice. A potential claimant who had actual notice of a forfeiture action may not oppose or seek relief from forfeiture because of the government’s failure to send the required notice. (D) be served on the government attorney designated under Rule G(4)(a)(ii)(C) or (b)(ii)(D). (2) if the property was not in the government’s possession, custody, or control when the complaint was filed, no later than 60 days after the government complied with 18 U.S.C. §985(c) as to real property, or 60 days after process was executed on the property under Rule G(3). (iii) A claim filed by a person asserting an interest as a bailee must identify the bailor, and if filed on the bailor’s behalf must state the authority to do so. (b) Answer. A claimant must serve and file an answer to the complaint or a motion under Rule 12 within 21 days after filing the claim. A claimant waives an objection to in rem jurisdiction or to venue if the objection is not made by motion or stated in the answer. (a) Time and Scope. The government may serve special interrogatories limited to the claimant’s identity and relationship to the defendant property without the court’s leave at any time after the claim is filed and before discovery is closed. But if the claimant serves a motion to dismiss the action, the government must serve the interrogatories within 21 days after the motion is served. (b) Answers or Objections. Answers or objections to these interrogatories must be served within 21 days after the interrogatories are served. (c) Government’s Response Deferred. The government need not respond to a claimant’s motion to dismiss the action under Rule G(8)(b) until 21 days after the claimant has answered these interrogatories. (7) Preserving, Preventing Criminal Use, and Disposing of Property; Sales. (a) Preserving and Preventing Criminal Use of Property. When the government does not have actual possession of the defendant property the court, on motion or on its own, may enter any order necessary to preserve the property, to prevent its removal or encumbrance, or to prevent its use in a criminal offense. (b) Interlocutory Sale or Delivery. (D) the court finds other good cause. (ii) Who Makes the Sale. A sale must be made by a United States agency that has authority to sell the property, by the agency’s contractor, or by any person the court designates. (iii) Sale Procedures. The sale is governed by 28 U.S.C. §§2001, 2002, and 2004, unless all parties, with the court’s approval, agree to the sale, aspects of the sale, or different procedures. (iv) Sale Proceeds. Sale proceeds are a substitute res subject to forfeiture in place of the property that was sold. The proceeds must be held in an interest-bearing account maintained by the United States pending the conclusion of the forfeiture action. (v) Delivery on a Claimant’s Motion. The court may order that the property be delivered to the claimant pending the conclusion of the action if the claimant shows circumstances that would permit sale under Rule G(7)(b)(i) and gives security under these rules. (c) Disposing of Forfeited Property. Upon entry of a forfeiture judgment, the property or proceeds from selling the property must be disposed of as provided by law. (a) Motion To Suppress Use of the Property as Evidence. If the defendant property was seized, a party with standing to contest the lawfulness of the seizure may move to suppress use of the property as evidence. Suppression does not affect forfeiture of the property based on independently derived evidence. (b) Motion To Dismiss the Action. (i) A claimant who establishes standing to contest forfeiture may move to dismiss the action under Rule 12(b). (ii) In an action governed by 18 U.S.C. §983(a)(3)(D) the complaint may not be dismissed on the ground that the government did not have adequate evidence at the time the complaint was filed to establish the forfeitability of the property. The sufficiency of the complaint is governed by Rule G(2). (c) Motion To Strike a Claim or Answer. (B) because the claimant lacks standing. (B) may be presented as a motion for judgment on the pleadings or as a motion to determine after a hearing or by summary judgment whether the claimant can carry the burden of establishing standing by a preponderance of the evidence. (d) Petition To Release Property. (i) If a United States agency or an agency’s contractor holds property for judicial or nonjudicial forfeiture under a statute governed by 18 U.S.C. §983(f), a person who has filed a claim to the property may petition for its release under §983(f). (ii) If a petition for release is filed before a judicial forfeiture action is filed against the property, the petition may be filed either in the district where the property was seized or in the district where a warrant to seize the property issued. If a judicial forfeiture action against the property is later filed in another district—or if the government shows that the action will be filed in another district—the petition may be transferred to that district under 28 U.S.C. §1404. (ii) the parties have had the opportunity to conduct civil discovery on the defense. (9) Trial. Trial is to the court unless any party demands trial by jury under Rule 38.